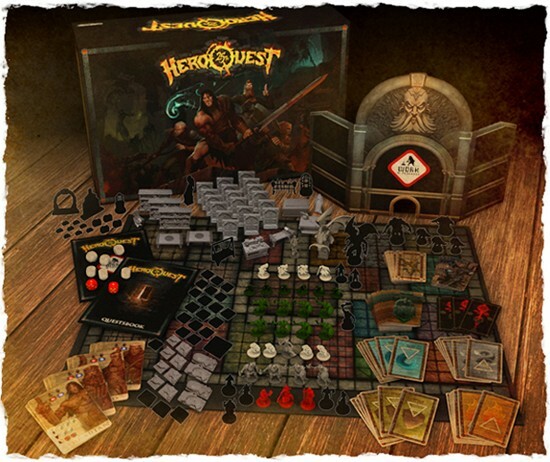 We present to you a new tribute game to the memorable HEROQUEST board game on the occasion of its 25th anniversary. In this new edition you will find new illustrations, new miniatures, new cards, a new board... All contents are new and fresh, to the highest possible standards as to pay a suitable tribute to the game that marked an era. We are not saying anything new if we say that there was a 'before' and an 'after' in our lives with HeroQuest. You have read it put in many ways, but all of them have the same roots in dreams, thanksgiving and nostalgia in common. Months ago, a partner of mine shared a link which led to a change.org petition. It was, at least, a wholehearted petition, but hiding an urge that, surprisingly enough, many of us shared without knowing: a conmemorative edition was demanded for to celebrate its 25th anniversary. When I talked about it with a friend, he made me understand that the petition was really open, not focused to a single company. It was a petition made mainly to two big fishes, but open to any third party. It was practically as if someone had put up a challenge. And what we did at GameZone was to accept it. After that came weeks of studying the legal aspects of the matter and getting in touch with people who could allow us to face this project. We quickly knew that no big fish was going to undertake this endeavour. It was complicated, costly and there was not enough time. Big companies have to plan their strategies with plenty of time, and none of them had announced anything nor planned to. The time left to get it done was simply too little. But not for a small fish. We could react in time and focus all our efforts in the development of this commemorative edition. It was now or never. Or we got to the task right away, or no one would. And there would be no HeroQuest 25th Anniversary Edition. The time lapse we have to achieve our goal is small, but enough for us. With the fundings raised thanks to this crowdfunding initiative we will be able to end the creative stage and prototypes, so we can start producing the actual components by early 2014. We have the knowledge and the tools, not the funds. The money we now ask for. With the right funding this HeroQuest 25th Anniversary Edition will see the light just in time for next year Christmas time, fulfilling the desires of countless fans, among which we are included. Available in English, Français, Deutsch, Italiano and Spanish. Other languages will be available if we get enough requests for them. BOARD (A side), BOARD (B side). PLASTIC RESIN, BARBARIAN, DWARF, WIZARD, ELF. MUMMIES, SKELETON WARRIORS, GARGOYLE, WRAITH, ORC BIG BOSS, SCENERY, SHE. We want to do this crowdfunding as simple as possible, with only three pledge levels of 65, 80 and 110 euros, to help you choose your pledge according to your interests. With the Level 1 pledge you will receive a copy of the HEROQUEST 25th ANNIVERSARY commemorative edition. All these copies will be numbered and the name you choose will be printed inside. These copies will also have a special FUNDER logo printed on the box cover; this logo will be exclusive to the copies purchased through this crowdfunding. 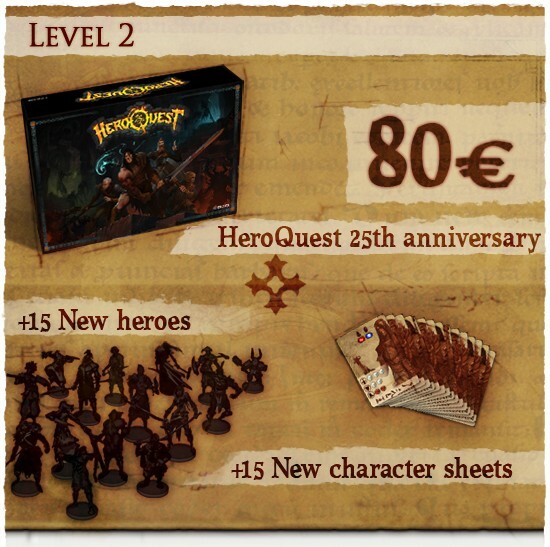 With the Level 2 pledge you will receive a copy of the 25th Anniversary HeroQuest commemorative edition. 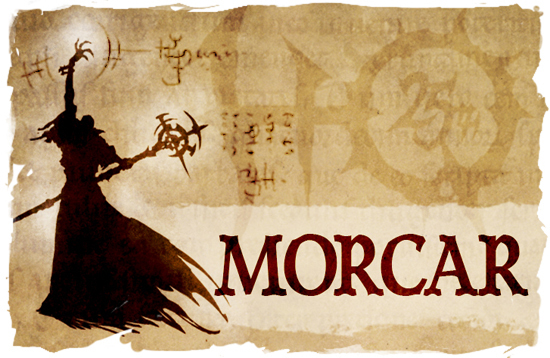 Plus, you will receive 15 new additional heroes, with their pertinent control sheets. All these heroes are different from each other and from those included in the core set, with unique miniatures and characteristics. + Quest Book volumen II "Mysterious Sand Books"
+ 3 Doubled-sided Map tiles (secret room/spider nest, gang way & abiss, lost path room/sewers). + 99 Cards (25 monster cards, 8 blank spell cards, 6 Primordial Chaos spell cards, 6 equipment cards, 8 spell cards, 6 treasure cards, 12 heroic cards, 10 fateful cards, 6 artifact cards, 3 Primordial Ignis spell card, 3 Primordial Aqua spell cards, 3 Primordial Aer spell cards, 3 Primordial Terra spell cards). + 25 Plastic Resin Miniatures (ogre, 3 spiders, spider queen, captive knight, female prisoner, captive assassin, 2 sleeping goblin guards, 1 goblin leader, 4 servants, vampire, vampiress, 2 stone guardians, 2 stone guardians -actives-, mole troll, Morcar, Zargon and She). + 1 Plastic Resin Great Wyrm (it occupies six board squares). 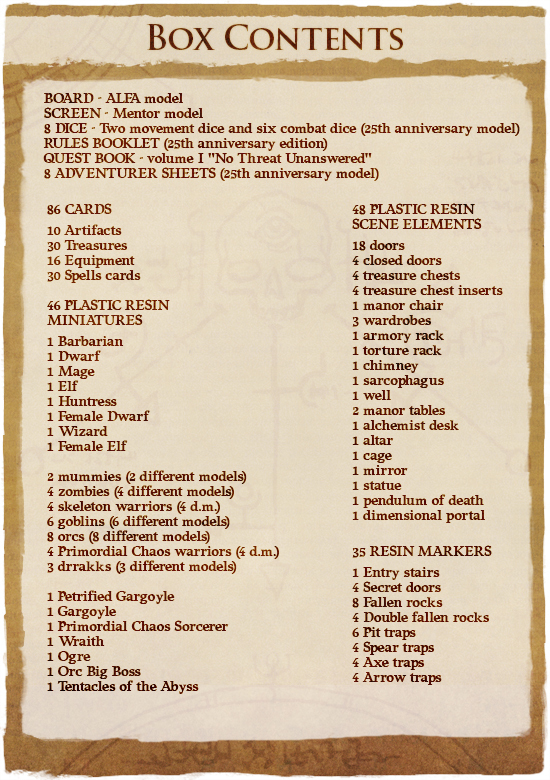 + 30 Plastic Resin Scenery (rolling boulder, guillotine, 4 levers, 3 sarcophagus inserts, vampire sarcophagus & insert, 2 spider eggs, goblin king throne, lectern & sand book, 3 treasuse insert, 2 close & 2 open portcullis, 2 ruins outside doors, 2 doors with magical locks, 3 barrels). Check the Stretch Goals section, further down for more info. To make the shipping costs issue simplier, which is usually a mess in almost all crowdfunding campaigns, we have decided that you don't need to pay for them during the campaign. Shipping costs will be paid for at the end. Once the campaign deadline is over, we will get in touch with you to check the exact items you want. Then we will determine the exact ammount to charge for the postage and packing. As the calculator we provided earlier didn't work quite well, and although it is already fixed, we have preferred to do what most of you suggested: a simple shipping cart according to the world zone you live in. Shipping will be tracked and signed for on delivery. Prices in the chart are illustrative only, but we keep working to offer you the best service. These prices are, in the worst case, the highest possible. Shipping costs are always the "ugly duckling" of these campaigns. To turn around this situation we have decided to apply the same successful shipping costs politics we use in our online store www.gamezoneminiatures.com. Unfortunately shipping costs do exist, but this way there is a chance for you to take advantage of them. 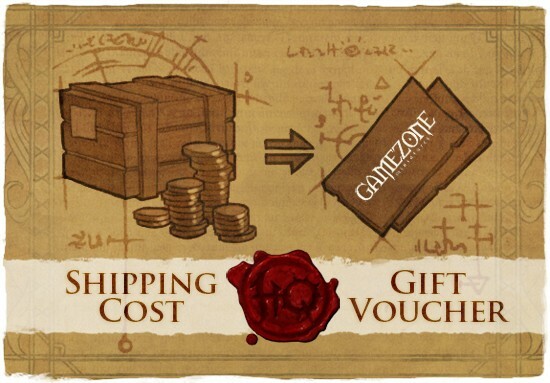 We turn your shipping costs into a gift voucher that you will be able to redeem for goods. Thus, the shipping cost becomes a direct discount in your next purchase at the Heroquest online store, which will open on Christmas next year, and you will be able to redeem it from then on. This way you will convert a painful expense into something practical. If you choose the third level pledge, you will receive all the stretch goals rewards achieved during the crowdfunding. The first reward will be the "Monster cards", which is a special one because it will be available for all pledge levels, not only the third. We have decided to keep all the rewards achieved in the previous campaign unlocked, available as soon as we reach the ammount of money claimed. Why? Out of gratitude. You have supported and backed us all the way here, and we really appreciate that very much. Besides, we have shortened all the rewards tiers to 10.000 €. We are well aware that this campaign will run slower than the previous one and with less backers, so the best way to compensate for this is to scale the tiers down accordingly. To make this commemorative edition more attractive, Mentor has thought of some secret rewards. These rewards will be revealed during the crowdfunding campaign. Exactly! 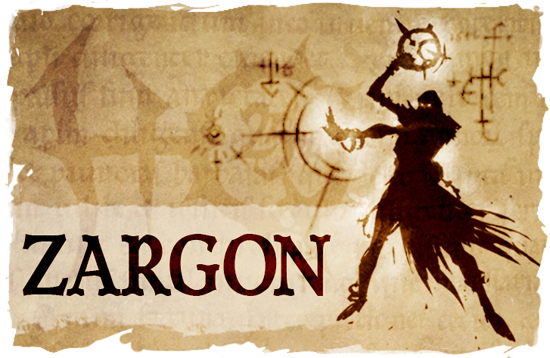 The final secrets are Morcar and Zargon, the most powerful allies of She. To add one of these articles to the package you will receive next Christmas the only thing you have to do is push the APOYAR button and follow the same steps you did when you joined the project. If you want more than one all you have to do is put correct money amount you want in the box multiplied buy the quantity. Each add-on is processed as a individual transaction so you don’t have to modify previous add-ons to make a new one. A practical example: I want 2 Bone packs so I click on its apoyar button, introduce 20 euros in the first box, select the method of payment and click the “realizar pago”. I also want the modular table to extend or just modify the basic box so I go back to the project page; I click over its apoyar button leaving everything as it is in the box I click “realizar pago” one last time. 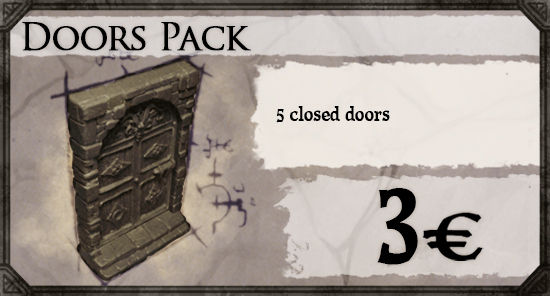 Doors pack (3 euros). Contains 5 closed doors, that is, 5 frames and 5 doors that you can add or remove from its place with just a ‘click’. Bold teenagers (5 euros). 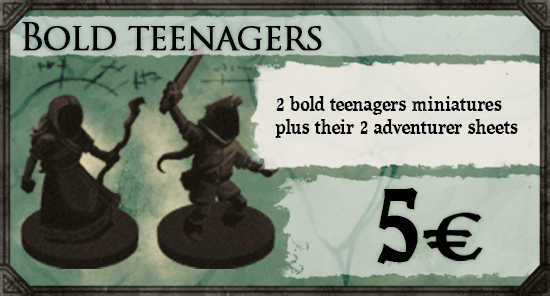 Contains both Bold teenagers miniatures and their heroes cards, for those of you who missed our 6th of January gift or want to expand the family. More info HERE. 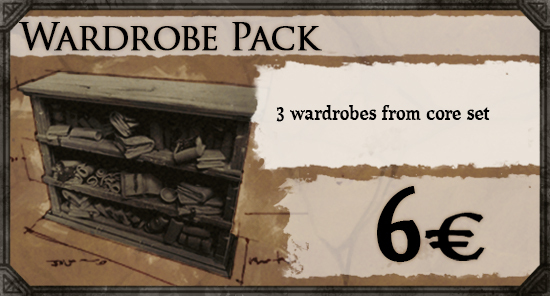 Wardrobes pack (6 euros). Contains the 3 wardrobe models from the game. More info HERE. Spiders pack (6 euros). 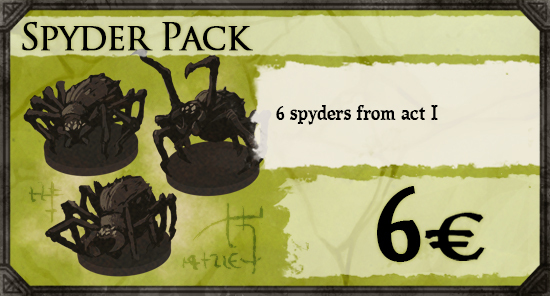 Contains the 6 spiders and 2 spider eggs from Act I.
Grey pack (9 euros). 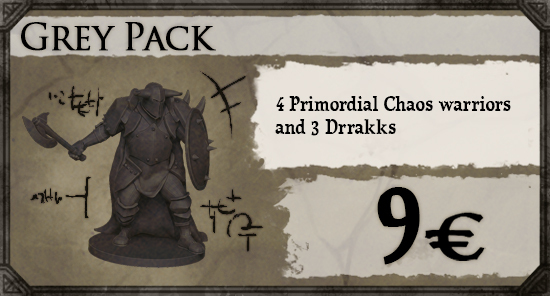 Contains 4 Primordial Chaos Warriors and 3 Drrakks. Enemies pack (10 euros). 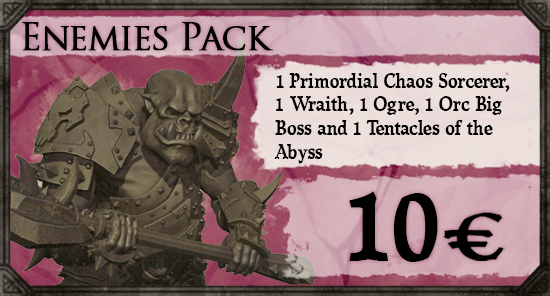 Contains 1 Primordial Chaos Warlock, 1 Spectre, 1 Ogre, 1 Great Orc Chieftain and 1 Viscosity of the Abyss. More info HERE and HERE. 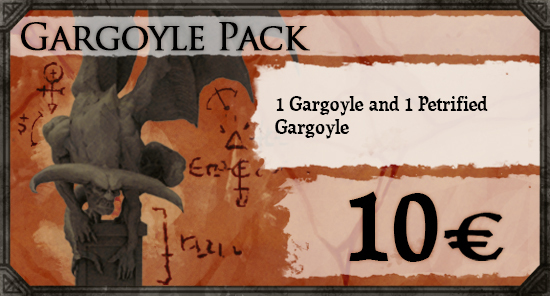 Gargoyles pack (10 euros). Contains 1 Stone Gargoyle and and 1 active Gargoyle. More info HERE. Bone Pack (10 euros). 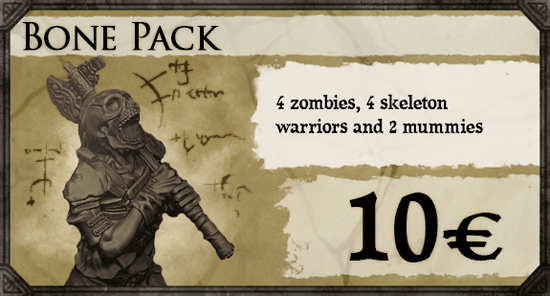 An additional 4 zombies, 4 skeleton warriors and 2 mummies. More info HERE and HERE. Green Skin Pack (14 euros). 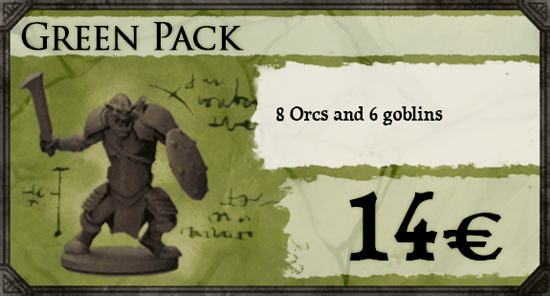 An additional 8 orcs and 6 goblins. Plastic resin markers pack (14 euros). 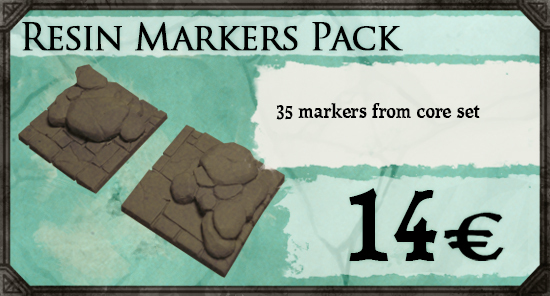 Contains all 35 markers from the game. Modular Board (22 euros). 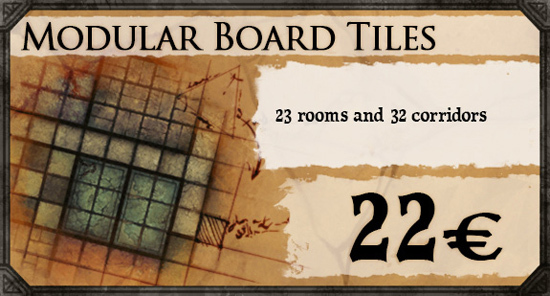 This pack contains 23 rooms and 32 corridor tiles. All or the pieces are double sided, one side is identical to the A face of the Alfa board model and the other is a different and alternative design to that of the B side. CLICK HERE to see all pieces. 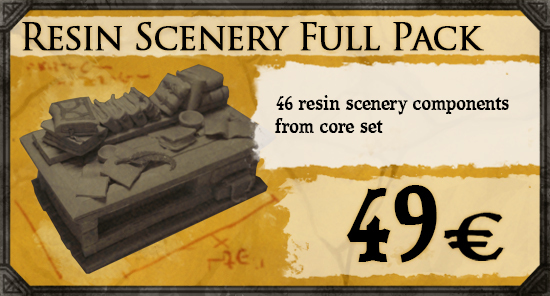 Resin Scenery full pack (49 euros). 48 resin scenery components from core set. It was unfair that HeroQuest was included under the label of an "abandongame” , as this has never been true. There are huge communities of players all over the world that keep this game very active. It would be more appropriate to talk about an "adoptedgame". Fans usually think of games ,which they like, as their own, and in this very one case with even more reasons. For both giants in our business this game is in no man's land: one of them has no interest in bringing it back to life, and the other simply can't. Don't think of us as strangers that want to take something from you, we are also players that want to give this game a second chance. Our intention is to develop and support it to get a viable comercial product, with plenty of expansions and additional features. Note: After some days offering our best efforts to you, our backers, we have come to realize that there is some kind of curse around this game. That is making our job more difficult, but not impossible. Why running a crowdfunding campaign at Lánzanos? 1. It allows us to speed up the whole creative process and, more important, the production process. It literally permits us to multiply our existing capacity. This way, by shortening the terms, the goal of getting the complete game in time for the anniversary is much more viable. 2. It gives a really interesting profit sharing. The usual procedure would have been going to a bank on our knees and ask for the credit needed to make the game. But then it would be the bank getting a good portion of the benefits. This way all these benefits go to the fans, in the shape of good material at a really good price. I'm not saying anything new here, but this is so obviously good that it deserves to be remembered one more time. 3. As you can see it really is a work in progress. We have preferred to show you what we have been doing. Everything we have showed is at least 50% of the work. We strictly adhere to the spirit of Crowdfunding by showing a product in the works, so that the backers can also see the progress and comment on it. We believe that it is one of the most complete ways to participate in the collaboration of the product. After carefully studying the path of other crowdfundings we have noticed that, at the end, the biggest risks to worry about are in production capabilities and delivery times. To avoid the first risk we can count on our own ability to design concept art, sculpt, mold, cast and package as we already have the capacity in our own installations. This way we will avoid any sort of delays as we will be able to react to any unforeseen event. Our current production capacity is already high, and one of the advantages, wich this crowdfunding will add, is to increase that capacity even more, and improve our quality. To avoid delays in the delivery times we have chosen a simple, direct and fail-proof system: the postal service. Parcels will be dealt with in our facilities and handled directly to you, with online tracking and sign for delivery. We have decided to do it this way to avoid risks, complications and unforeseen long delays, as well as discarding other more expensive options and longer delivery times. Courier services offer a quicker service, but with considerably higher prices. Sending all the boxes overseas in one single container adds more than 20 days to the process, without adding further handleing and individual delivery in the destination country. Thus, this option was also opted out. There is still a minor risk, however: inexperience. And we say 'minor' because we have been producing our own miniatures, as well as covering other hobby companies assignments, for twelve years. During these years we have seen fellow companies "set on fire off the shoulder of Orion..."
Estimated shipping date: december 2014. This Heroquest version is a tribute remake of the original game to commemorate its 25th anniversary. All illustrations, board, miniatures, rules and any other components are brand new and property of Gamezone Miniatures. 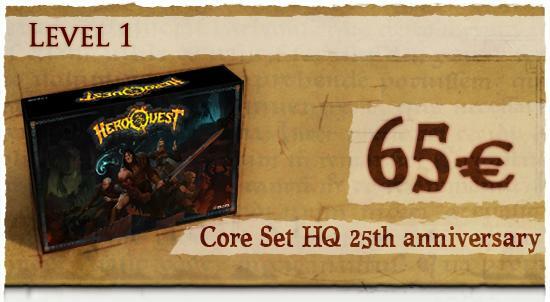 You'll receive a core set copy of Heroquest 25th Anniversary (exclusive collectible version for this crowdfunding). You'll receive a core set copy of Heroquest 25th Anniversary (exclusive collectible version for this crowdfunding) and Adventurers Extra Set. 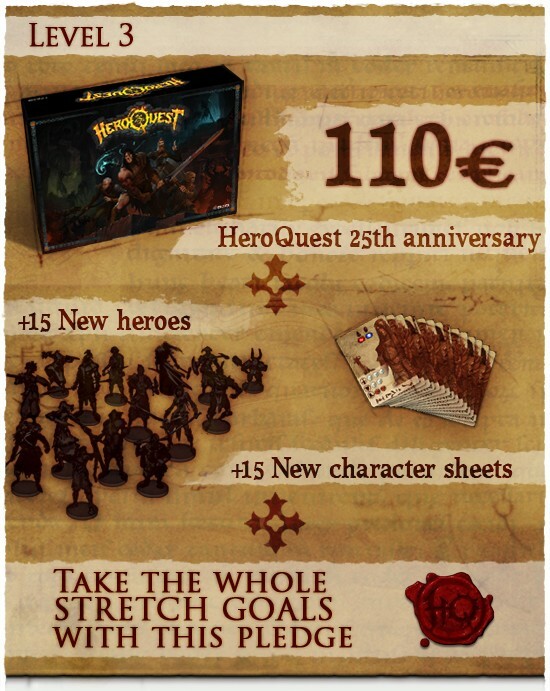 You'll receive a core set copy of Heroquest 25th Anniversary (exclusive collectible version for this crowdfunding), Adventurers Extra Set and all unlocked Stretch Goals. 4 Primordial Chaos warriors and 3 Drrakks. 1 Gargoyle and 1 Petrified Gargoyle. 1 Primordial Chaos Sorcerer, 1 Wraith, 1 Ogre, 1 Orc Big Boss and 1 Tentacles of the Abyss.